The first He-Man toy I remember getting was the Road Ripper. And packaged with that Road Ripper was my very first He-Man figure. Now, I knew that, in the cartoon, He-Man wore a harness. I didn’t care. Once I opened him and got some play out of his action feature, I was sold. No, as a kid, I didn’t have a standard He-Man figure. I had Battle Armor He-Man and he was much, much cooler. Even now, so many years later, when I think of those old figures, when I think of He-Man, I remember Battle Armor He-Man first. I think there’s a couple reasons as to why my adult brain can still justify Battle Armor He-Man being the primary. One, it’s cool. From the original figure, to the staction, to this Classics release, it just looks good on him. Two, it was heavily pushed on the packaging & vintage oils. During the period that I was most into MOTU, it as Battle Armor everything. Skeletor had his own version and those two were used on a lot of packaging. They both had single releases, they both came with their cats, they both came packaged with vehicles, heck, and they were both featured on stuff they didn’t come with. Even the box for Snake Mountain had the Battle Armor versions fighting for the future of Eternia. Nearly everything I remember having as a kid, had BA He-Man on the package. Three, it still has, to this day, one of the coolest action features ever. The original was a figure that took damage and could right itself. Manglors could do that too, but, let’s face it, they were freaky. Battle Armor He-Man was all that and a normal action figure. He became the quintessential He-Man in my child eyes and I haven’t given up that belief to this day. Now, I know if you’re a little older than me or if you’re really into original concepts, then you’ll disagree. I’m cool with that, but as far as I’m concerned, I finally get to review He-Man. Battle Armor He-Man is built from He-Man. Big surprise, I know. I’d like to link you to a review of the original He-Man, but… um…, we haven’t done one yet. Probably something to do with the fact he came with two left legs (see below). We do have the reissue though, so we should get on that. 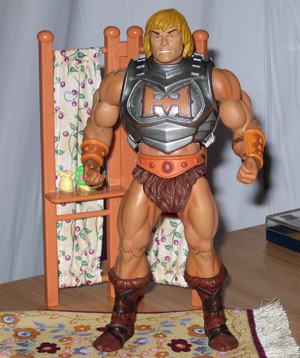 If you have He-Man, either regular or reissue, this is the same figure except for the ab-piece. It’s been replaced by the smooth lower torso that some of the armored figures wear to give the illusion that the armor goes down to the belt. Both this smooth ab piece and the upper torso are molded silver to keep the look consistent. Gone is the traditional harness, replaced with a great update of the classic Battle Armor. All the expected details of the original are present with the added touch of the squares at the shoulders (reminiscent of the regular harness). This armor is different than what we’ve seen before. Instead of hooking under the arms and snapping shut, it splits down the sides into two separate pieces. It’s also made of a regular sturdy plastic instead of the softer armor on Randor and He-Ro. This gives me some pause when popping the tabs, as I might break it with too much use, but I haven’t had any problems yet. And before I forget, this figure also includes the standard battle axe. Articulation is the standard for the line except for where the armor interferes. The ab-crunch is slightly blocked and the arms are unable to come down to the sides. One interesting thing is the head on this figure is very easily removable even though it doesn’t need to be. The barbell for the head has been tweaked with two small canals on the ends to prevent a vacuum from forming in the head cavity. The ball-joint has great range and the head can sit high on the neck, allowing for space between the chin and armor. I’m probably pulling the head a little off that top ball to create that space, but I don’t care. I’m happy about seeing the neck because the lack of a neck was the one thing I didn’t like when I saw the early photos. Okay, I said that the head and armor touching was the one thing I didn’t like. Well, that’s not quite true. There was something else that I didn’t like, but had to accept. The figure is an update of another figure with one of the greatest action features of all-time. Yet, it has no action feature. This is something fans of many characters are going to have to swallow as the line goes on. Mekaneck won’t extend, Roboto’s not going to get his working gears,* Sy-Klone will only spin if his waist is loose. The classics figure overcomes the lack of action feature by having three removable chest pieces. These are just like you remember: unscarred, one slash, and two slashes. These are sculpted and detailed with the symbol, rivets, and battle damaged all raised. For what it is, it’s nicely done. Though you’ll find me lamenting the lack of action feature on a few message boards, I have to face the reality that I’ll likely choose one plate over the others and that will be how he’s displayed. Yesterday, I would have said one slash, but today I’m betting on unscarred. I think this will be true for most collectors; they’ll pick one and stick with it. Partially because it’s what we do for most figures and partially because you have to remove the armor to change the plates. I’m not a big fan of that, but I don’t know if there would be a better way (action feature aside). * – For some reason, I find this one most heartbreaking. I’m not as happy with the paint on this figure as some earlier releases. The paint on the gauntlets and the belt is sloppy at best. The belt bleeds onto the loincloth and the right wrist cuff doesn’t have enough darker paint to fill the space it should. The armor itself is molded the correct color and free of paint issues, but the symbol on the chest is another matter. These look to have been stamped on the plates. Of the ones I looked through on Friday, most of them aren’t quite in the lines. There is an uneven gap between the orange and brown paints on all the plates and some of the ones we received were missing by more than a little. Overall, I’m excited to finally have this He-Man. We have the standard MOTU buck pulling most of the work. We have a great piece of armor that can at least mimic what made the original so great. Yes, the action feature is missing and that takes a lot away from what he could be, but what’s left is still a great figure. We put up an Adora review on Friday. And for more MOTU reviews, check out our MOTU Classics Collector’s Guide. Good review! I don’t have as much a stake in it, but I always like the more armored version. Though his arms and legs should be armored up too to make sense. I think it was Vault who was telling me that the other day too. LOL. He could use a more full armor – personally, I can not wait for a Classics Snake Armor – but I figure he goes around in a leather harness most of the time, so he must feel pretty safe. I passed on him. No action feature, no sale. He’s a good fig cuz they all are, but this one was his action feature. i would say this to those lamenting the loss of the action feature… 1) be glad this one can’t BREAK on you… i’ve never in all my years seen a played w/ BA he-man who hadn’t either had the catch worn down and was stuck on 2 slash panel forever more, or got sand in the mechanism and coldn’t turn at all anymore. and 2) you didn’t here we real old schoolers complaining about the lack of the spring waist. it was nice, but it wasn’t what made the figure, cuz again, it always eventually broke. And, though you have leaped onto the first comment about not being intested in BA He-Man to support your conclusions :D, you should check around the net to see the various places I posted the question of which He-Man is your “primary”. I’m getting the full gamut of responses between the four options. Thunder Punch seems to have been particularly popular too! not a problem… i’m up early in the AM anyways to get the boys to school. besides, 10 minutes is a falacious estimate… the site can’t support that much traffic… we have at LEAST 30 minutes to get that fig ordered. He can’t last that long under your version of Jan 15th’s events. If they make one amount for the monthlies and then remove the subscriptions, there will be the exact same amount of Trap Jaws available as there were Adoras next month. Since Trap Jaw can be two people and is presumably more popular, he shouldn’t be able to last 27 minutes unless something goes seriously wrong with the site. you’re forgetting the traffic gasket… while you could order trap jaw in whatever qty, only so many people can be ordering at one time. i suppose he COULD go faster than adora, but i certainly don’t think substantially so. But the traffic gasket applied to Adora also, so that’s equal. By your estimation then, Adora sold out at the maximum speed that a figure can sell out? Why are you hatin’, troll? Why come to a thread where people like BA He-Man and knock it left and right? Go back to the .Org! i do love keeping folks grounded! 😉 but yes, no hatin’… i did buy the damned thing, didn’t i? i’m giving it a chance… and in some ways, i think it’s a definite improvement over the vintage BAHM. If you say so. Hard for those of us not in the know to tell the difference. THUNDER PUNCH!!! I think he was my first He-Man. I had a bunch of the other characters before He-Man, cos he was always gone, but I somehow managed to get a Thunder Punch. I didn’t have Thunder Punch, so I had to rely on a friend that did. I liked that one a lot too! I tell you what, you don’t mind nearly as much as you think you will. At least none of us did. The look is there and the plates let you pick a favorite at least. The original was and still is the best. Good review though. Somewhere out there, there’s a dude that loves Flying Fists. That’s the beauty of He-Man. yup, there’s another old schooler… who loved he-man when he was the post powerful man in thee universe, not the wimp who needed armor… you didn’t see conan running around in heavy armor… that inexplicably left his limbs exposed. I was just talking yesterday about how I wouldn’t mind a serious stab at Wolf Armor in the Classics line. Maybe as a proto- Heman though. Thanks! I wasn’t sure if it was noticeable or not. Kinda easy to gloss over! MAA is up there with Hordak in terms of sheer evil. If BA had been a new character, I’m sure MAA would have “saved” some dude after a freak accident to make him. Your pictures look different today, not bad, but odd. Did you get a new camera? I like the review, but why is Heman laying down in the third picture? Same camera, no flash. I tried some differnet settings/techniques on this one because the armor caught too much light. I like how it turned out though, I may use it going forward. He’s makin’ sweet, sweet love to his battle axe. You’re ruining my awesome picture! As I explained, it hurts to take two in the chest. well, that armor is heavy, and it doesn’t breathe well… remember, he-man is used to airflow through his gear… he’s probably a little dehydrated. BA He-Man doesn’t interest me much, but the idea of a Mekaneck or Roboto without their action features severely hurts my interest in those figures. TG has said many times that at least mekanek will come w/ neck extensions, so he’ll have a pretty good approximation of the feature… roboto’s gears, i fear, just can’t be done in this line… that’s WAY more work than i think they’re willing to do, cuz that would require a whole new torso construction. i think he’ll be cool, but if you’re one of the guys whom the gears “made” roboto for… yup, get used to disappointment. As long as Roboto gets a clear chest and at least sculpted gears in there, I’ll live. I do want a more updated head though. It may be vintage blasphemy but the old one didn’t have enough shape for me (though I loved him a lot). Me too. But like DR, said I can accept the neck extension piece on Meks. I do hope they find a creative solution to keep the look of Roboto the same. And I still want Rio Blast’s stuff to fold out rather than clip on – at least some of them. I don’t find that to be very action feature. i’d like that too… best you get to work conning them on this, cuz that would require a lot of new parts… and you do have the “ask mattys” to plant the bug in their ear, like you did w/ BA faker. I do too! I have to admit that the armor fits together well and makes for a great look. I can live without the cylinder inside. I’ll take Roboto with whatever limitations he comes with…he was one of the later additions, but he still became my favorite of He-Man’s Homeboys. I’d lament the loss of gearing too, but there are some compromises I’d suggest. Mattel could give him a lenticular sticker, like the GI Joe BATs had. Or, work within the the constraints. The articulation you’re preserving is mainly the ab hinge, right? They could add in gearing around the ab hinge that turns using it, rather than around the waist and jaw mechanism. It probably wouldn’t be cost-effective, but it’s an idea. And yeah, they’d have to make a whole new torso that probably wouldn’t work elsewhere, but Roboto would probably have to be a 100% new mold anyway. Roboto can use other pieces from the waist down and the right arm, so hopefully that will get him done sooner than later! that’s the tough thing, between the ab hinge and the extra space needed in the torso for the neck and shoulders, there’s not a lot of room interior to squeeze in tiny gears. i agree w/ noisy here, he could reuse the trap-jaw shoulder and bicep, and the thighs… though i admit i’d like to see the 200X style calves/feet brought in… but if you went vintage feet, trap jaw again could provide legs. and in a pinch, the crotch plates as well… the only new parts he’d require are torso, head, & forearms. There’s not too many fans of his big feet, but I liked ’em. if nothing else, it gave him great stability. Yep. I liked the redesign of him as much as I like the classic. I’d be happy if the split the difference in classics. Oh yeah, before I forget, good review once again! That third pic made me lose a piece of granola. But I was taking pictures and I wanted each plate to have it’s own and I thought it’d have to really hurt to get hit so bad that your armor buckles. Dude, is that what happened? I thought He-Man just tripped or something and landed on his chest. Okay! I like your version better! That is now “what happened” ! Would have liked to see a photo of the BA harness on regular HM. I don’t think the silver ‘shirt’ was needed but have not seen a photo to be sure. Didn’t buy BA HM so I can’t solve my own question. I can see that some people would be okay with that, but I do like the silver under the torso better. Hmm. I think I’m good with the silver undershirts. I think it’s better to have it than not. I’m still looking to see what that bread came from. if they could have sold us the BA armor for like 5 bucks, i’d have likely bought two or three for customs… i don’t think the ab section makes 20 dollars worth of difference. I agree with that, but none of them are really worth the $20 so I don’t think about that part. Maybe the armor could end up in some of the weapons packs and you can still do your customs. I hated the action feature even has a child. cause it would never stay where I wanted it. My cousin had a defective one too, but mine worked great. It still does too. I have no regrets about buying the classics version. He looks spectacular! Mine still works too, but I’m most happy with the modern look. that was an awful lot of friends who ALL sucked and broke their toys… and more than just friends, as several lots of figs i bought again back when ebay was still new had BA skellies and he-men and none of those worked properly either. and since you can drop a boxed one and get the plates to pop, you guys must have been awful careful w/ your he-men… maybe you weren’t playing w/ them enough. were you posers when you were kids? LOL. You’re triggering the spam filter. BA He-Man was more “my He-Man” as a kid, too. Not that I disliked the standard version in any way, but both BA HM and Skelly were ace. i also love how he-ro was apparently so ripped that his abs punched out his armor plating, but poor he-man needs to do more crunches. to be honest, after seeing the various armor abs vs painted over regular abs, i’d have no problem at all just using paint over the standard really ripped abs… i do’t think the armored ab section is worth the effort. he-ro & randor look fine to me. if they want to keep painting undershirts on the guys, that’s fine, but i think even the flesh toned abs under the armor is fine, whether under this new hard armor, or under the flexy armor of randor, hordak or he-ro. speaking of which, i wonder why the armor was changed? i don’t the flexxy armor is so soft that it wouldn’t have held the plate in place. i certainly like the flexxy armor closures better, they don’t feel as prone to breakage as the hard armor points. this new armor doesn’t feel any stronger than the vintage armor, whic hheld up up well, but was far from indestructible… a stray knee or elbow or a decent drop and those closure points snapped right off. I don’t like the abs on He-Ro, but the classic figure had them. I’m not sure what the decision on Randor was, but I don’t mind on him because I like him without the armor too. On this He-Man, they got it right. I wouldn’t have liked the heavy ridges and the abs visually. Great review! This version has always been my favorite. I’ve got the original (it still works! ), the awesome staction of it, and now this one. I would have liked the action feature, but it looks great and that’s much better to me! Mine too. I didn’t get the staction, I missed that whole last wave – but it did look really cool. I think you’re on to something about this looking better than if the action feature was in the chest. I think they struck a good balance on this one. What chest plate are you using? I’m still intending to keep the unscarred one. You have to go with at least one scar! That’s the whole point! Plus, I have the staction for a clean version already. No, lol. But I guess I should! Yep, this is my He-Man. I agree, it’s more important to keep articulation and the overall look instead of the action feature. These comics were fantastic, I think you’ve raised the bar for yourself. Totally dug the Batman reference! Thanks, 3B! I’m glad you liked ’em! I don’t think that will be this years, but that would be spectacular. I’d love to see Mattel cross the lines. I don’t know if DC has to agree/approve, but I hope they would if they have to. The only thing though is that Superman would have to have a skirt! I know it’s a rival site… but… it’s the one my co-worker sent. We don’t view them as rival sites. I love AFI! I have that comic somewhere. I think it’d be a great idea. I just hope they could solve the articulation problems the MOTU hips bring. I never had these variants, only ‘basic’ figures of the two leads and a couple extra characters. I guess I didn’t get the need for having a variant back then? I did know someone with this, but I have no clue who it was. I know it had to be someone at school, as we lived out in BFE. I will say if I was still into them, the fact the “action feature” has been changed so drastically would have put me off buying this guy. I guess the production team forgot how fun it would be to tap that shield to flip it around? As long as you guys are enjoying them, I guess? I’m in-between on if the feature would be cooler or not. The aesthetic is better off without it, but the plates don’t do much for me.